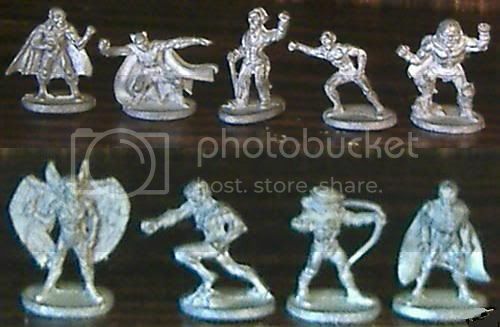 These pewter figurines were produced as part of the set 9501 Justice League of America & Adversaries, for use with Mayfair Games DC Heroes role-playing system. 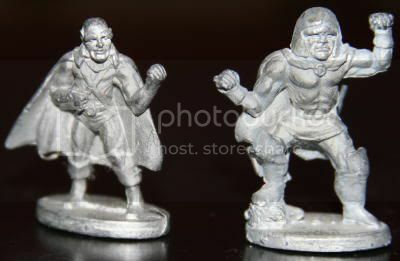 The ten figurines were sculpted by Andrew Chernak and John Dennett, and stand roughly 1.25" tall on average. You can see them all in this PDF of Grenadier's 1987 Photographic Compendium. Good luck making out the individual figures. I managed to find the original box art on the internet, as well as views of what the interior packaging looked like. 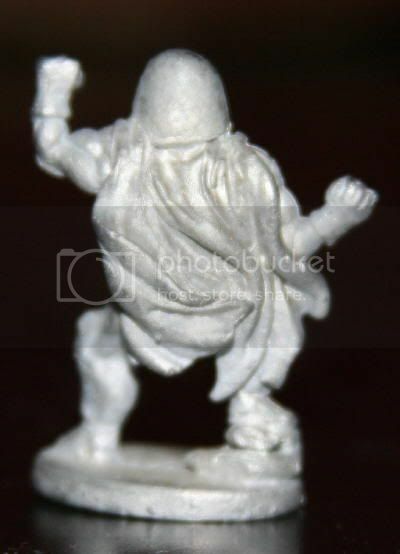 I also stumbled onto an expired eBay auction with nine of the figures, and swiped the pictures below. 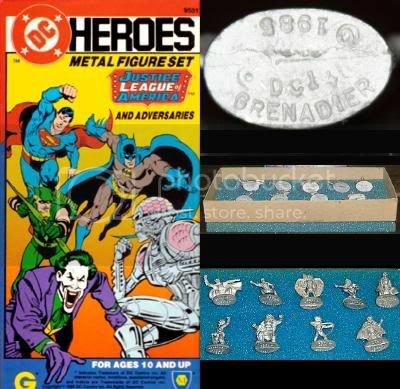 Based on past knowledge, fuzzy online references, and supposition, I came up with Darkseid, Superman, Batman, Martian Manhunter, Hawkman, Green Lantern, Green Arrow, Brainiac, the Joker and the Flash. 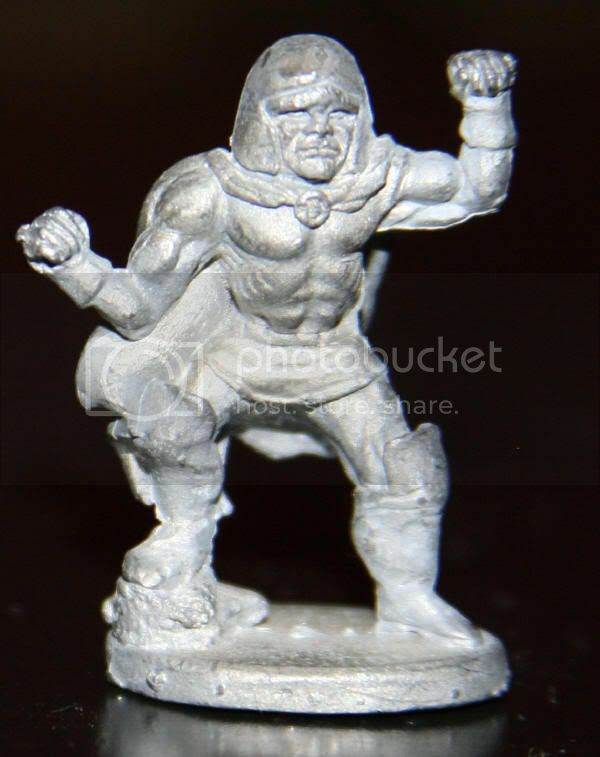 I bought three of these figurines off eBay in the late '90s, Darkseid and two Martian Manhunters. One was to be painted for me by a former customer/friend, but was never seen again, so now I only have the pair. Darkseid was just becoming a big deal in the '80s through his prominence in the Super Powers Collection. For more information and pictures of Martian Manhunter, click here. Darksied is a bit chunky but still looks pretty cool. sorry to hear about the ManHunter that got swiped. i miss the robotic Brainiac. I like green Brainiac, but the design for robot Brainiac could have been recycled for Metallo. That Terminator wannabe needed the panache. Maybe from the back, but I have it on good authority Marko can't shake his groove thing with Darkseid's panache. Can I assume that there is some value in the figurines? I've been attempting to research them for a few years now and yours is the first site I've seen that has any information. I have the entire set in the original Unopened box. I would be curious as to what you paid for the 3 you have/had. Honestly? I don't think they're worth much. I bought and sold mine cheap, and they're so little known, there doesn't seem to be much demand. Maybe in the future, though...? SDCC For You and Me? 2001 Stuff Volume 2, Number 13: "Why?"